Smoking is injurious to health – and more so for women. According to doctors, smoking can lead to multiple complications in women and the very first heart attack could lead to sudden death. Praveen Aggarwal, chief cardiologist, Escorts Heart Institute and Research Centre, New Delhi, confirms a series of heart attacks among female smokers. “If a woman is smoking from a young age then she stands a greater risk of contracting heart problems. Female smokers who use oral contraceptives risk serious after-effects, including increased risk of developing cardiovascular diseases, such as blood clots, heart attacks and strokes,” Roa added. Sanjay Mittal, also from Metro Hospital, said during pregnancy smoking increases the chances of sudden infant death syndrome, learning disorders and attention deficit disorder in the child. If a woman is in a child-bearing age and still smoking then it will have a bad effect on the child during pregnancy along with a greater risk of heart attack to the mother. 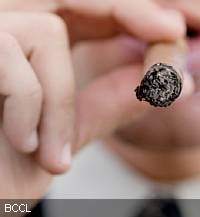 According to a new World Health Organisation (WHO) study, one in 10 women in urban India smoke or chew tobacco. The WHO report also estimates that seven percent of women in developing countries smoke compared with 48 percent men. “Women who smoke are at a higher risk and face a number of health hazards such as heart disease and lung cancer,” said K.K. Aggarwal, president, Heart Care Foundation of India. “Women who quit smoking have a 21 percent lower risk of dying from coronary heart disease within five years of quitting smoking. The risks of dying from other conditions also decline after quitting, although the period varies depending on the disease. For chronic obstructive pulmonary disease, it may take up to 20 years,” he said. According to a study, smoking leads to greater risk of developing cervix and vulvar cancers. Nineteen percent of cervical and 40 percent of vulvar cancer are caused by smoking. – Smoking greatly increases risk of heart disease and stroke. – Smoking causes interruptions in menstrual cycle and induces quicker menopause. – Smoking causes pre-term delivery, low birth weight, miscarriage, and neonatal death. – Children born to smoking mothers experience more colds, ear aches, respiratory problems, illnesses. – Female smokers are more susceptible to osteoporosis. – Smoking causes more breathing difficulties in women than in men.